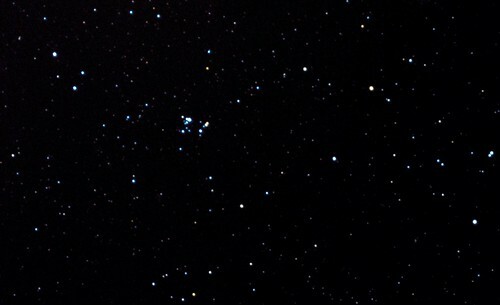 This is an open cluster nesting in the Orion constellation known as "The 37 Cluster" (NGC2169). The brightest stars in this cluster align as the number 37 by pure chance...or is it chance?!? Once again, I have shot this image in the least favourable conditions and a few obstacles. Obstacle 1: Imaged in Inner London (Peckham) which is one of the heaviest light polluted cities. Obstacle 2: Imaged from inside my living room window with my telescope mounted on a sturdy table but on a rickety floorboards! 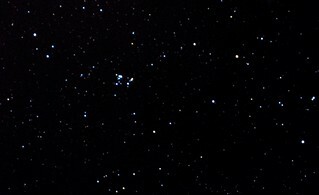 Obstacle 4: 80mm refractor is not a high enough magnification for imaging this cluster so the image is cropped to a 1/3 of original. Can't crop more as would look pixelated. Mount: Nexstar 6/8SE Alt Az on a sturdy table but on rickety floor boards! No light pollution filters used. Stacked with DSS (Deep Sky Stacker). Light pollution reduced via native curves and level components in Photoshop. No other tools used.